Depending on if you are travelling to/from Kakadu or visiting us as a day tour from Darwin, there are a number of attractions in the outer Darwin region that you may have time to enjoy along with our wetland cruise. How you plan your trip will depend upon the cruise time that you want to take. Fogg Dam Reserve (closest stop to Darwin) - located approximately 65km from Darwin and just off the Arnhem Highway this is a great area for birdwatching. Managed by Parks and Wildlife NT there are several short walks available here or you can just observe birds from the viewing platforms. Window on the Wetlands (10 minutes past Fogg Dam) - This information centre is located between the Fogg Dam Reserve turnoff at the Arnhem Highway and the Adelaide River. It provides a scenic lookout over the Adelaide River and the surrounding floodplains. It is also great for kids with lots of hands-on activities displaying information about the wetlands and the animals that inhabit them. Jumping Crocodile Cruises (5 minutes past Window on the Wetlands) - between the Fogg Dam turnoff and our cruise you will see signage for several different Jumping Crocodile cruises operating on the Adelaide River. These cruises all depart at the same times 9am,11am,1pm and 3pm so are easy to fit in around our cruise. They are a great if crocodiles are all you want to see as they get them up very close to the boat before making them jump out of the water after food. 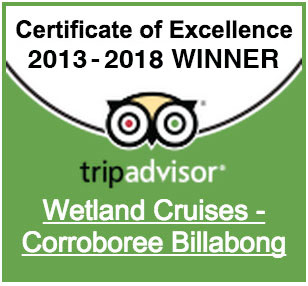 We do not feed the crocs or make them jump on our nature based cruises so this is a totally different expereince to what you will get on the wetlands at Corroboree Billabong. Corroboree Park Tavern (15 minutes past Jumping Crococile cruises) - Have a look at an Albino Buffalo and see "Brutus" the local saltwater crocodile. This is the pick up point for passengers wishing to catch the shuttle for Wetland Cruises. Corroboree Billabong is only 20 minutes from here and truly is a Wetland Experience not to be missed. Berry Springs - ( 30 minutes back from Corroboree Park Tavern down the Arnhem Hwy to the Stuart Hwy, then 15 minutes south ) located approximately 60km from Darwin off the Cox Peninsular road this is a great area to have a relaxing swim at anytime of day. It is only an extra 15 minutes drive down the Stuart Highway past the Arnhem Highway turnoff to reach this beautiful spot. Berry Springs offers a small waterfall along with crystal clear plunge pools set in natural tropical surroundings. Territory Wildlife Park ( Located right next door to Berry Springs) - this is a very popular tourist attraction. The Wildlife park has been constructed with large animal enclosures in bushland surroundings. It offers walk through bird avaries, an underwater aquarium, Nocturnal house and reptile centre. It also has birds of prey displays and other special events happening at regular times throughout the day. There is a lot to see and do here so we recommend this attraction is all you try and fit in along with our wetland cruise or you will not have time to visit all of the exhibits. Alternatively, leave this and Berry Springs as a full day program for another day.